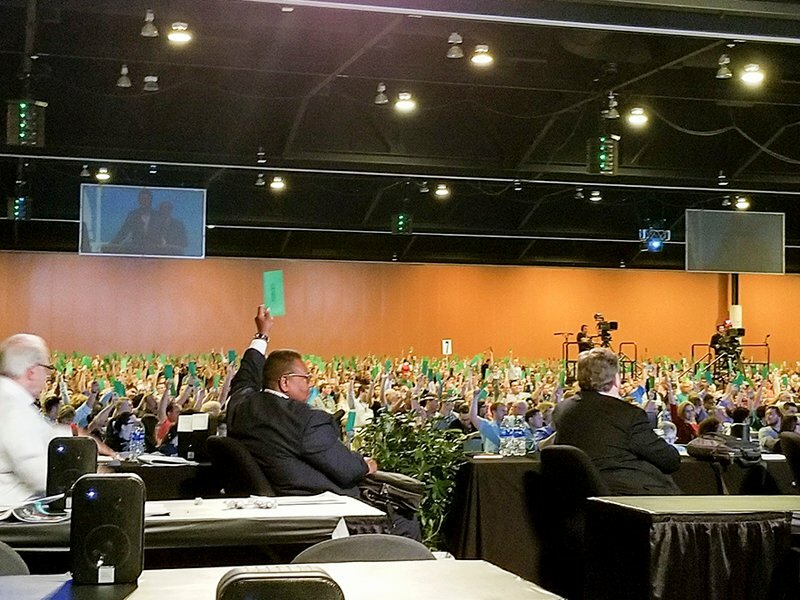 The unusual move on Wednesday (June 14) was a shift from the previous day, when the Southern Baptist Convention’s Resolutions Committee declined to bring to a vote a Texas pastor’s proposed resolution condemning the “alt-right” movement, whose members include white supremacists. “(W)e denounce and repudiate white supremacy and every form of racial and ethnic hatred as a scheme of the devil,” reads the one-page statement distributed just before the last session of the two-day meeting. Passage of the resolution was met with thunderous applause. Resolutions Committee chairman Barrett Duke said Tuesday the original proposal was “too open-ended” and could be misinterpreted. A day later, he apologized. The Rev. Dwight McKissic, who authored a proposed resolution about the Confederate flag at last year’s convention that was rewritten and passed, didn’t understand why the resolution wasn’t dealt with in a less confusing way. “I’m very heartened by the statement,” he said in an interview about the new version of the resolution. The resolution’s failure on Tuesday prompted indignation and anger as younger evangelicals, including African-Americans, took to social media to vent their feelings. The decision made at #SBC17 to not denounce white supremacy is hurtful. But the social media backlash was just another episode in the Southern Baptist Convention’s fraught history on race. “There’s obviously a discomfort with this subject matter,” said McKissic. The SBC was founded in 1845 in defense of slave-holding missionaries. In recent decades, leaders of the denomination’s public policy wing, the Ethics and Religious Liberty Commission, have pushed for stronger statements condemning that past. Richard Land, the former commission head, was instrumental in the passage of a 1995 resolution in which Southern Baptists lamented slavery and apologized to African-Americans for condoning racism. Two decades later, ERLC President Russell Moore called for the repudiation of the Confederate flag. “When we stand together as a convention and speak clearly, we are saying that white supremacy and racist ideologies are dangerous because they oppress our brothers and sisters in Christ,” Moore said from a microphone before Wednesday’s resolution was overwhelmingly adopted. Paige Patterson, president of the Southwestern Baptist Theological Seminary, called the new resolution “tremendous” but said action is needed more than words. In the end, it was grass-roots pressure aided by a social media storm that caused the Resolutions Committee to reconsider. “Now suddenly you have this panic,” said Alan Cross, a white Southern Baptist minister from Alabama who has written a book on racism. In the end, black Baptists and white Baptists agreed that the denomination had ultimately done the right thing. Matt Bowman, a white Tennessee pastor, believed it was important to pass a resolution whose meaning wouldn’t be twisted by others. After influencing Southern Baptists to speak out on race-related matters two years in a row, McKissic said work on the issue is far from over. He welcomes the selection of Florida pastor H.B. Charles as the first black president of the SBC’s Pastors’ Conference earlier this week, and the continuing election of people of color to other one-year terms of leadership. “Until minorities are included in the ownership of the convention — we’re a long way from there — we still got real problems here,” he said. 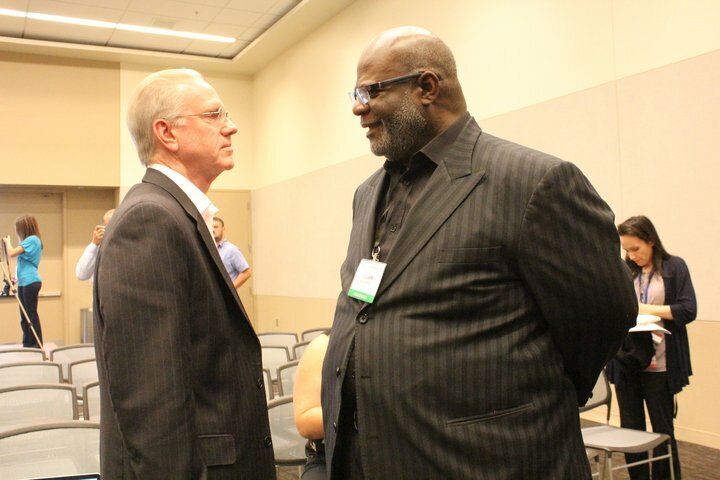 Roger S. Oldham, spokesman for the Southern Baptist Convention’s Executive Committee, said a 2011 report recommending steps to diversify leadership in the denomination’s seminaries and agencies has made a difference beyond the many resolutions that have been passed on the subjects of race and diversity. “We’ve seen what we believe is a marked increase in the number of very highly qualified but perhaps previously unknown individuals from a number of racial and ethnic backgrounds,” he said. Another example of the evil that comes from organized religion. I don’t suppose they will also condemn Black Supremacy movements. Gosh…and only about a hundred and eighty years late, too! Isn’t Pastor McKissic one of the pathetic bigots who blamed Hurricane Katrina on Gay people? If New Orleans had never been even close to a hurricane before, and that it wasn’t hurricane season, it might have been more impressive. Everyone with even a passing knowledge of Christian history knows that in the first couple of centuries, the pagan Romans would scapegoat Christians for every natural and man made disaster. Apparently, Pastor McKissic didn’t take that lesson to heart, what with the handiness of a Gay scapegoat to soundly beat, and encourage others to join in on the fun.. The Rev. M apparently later apologized for the “insensitive” and “unnecessary” comment. Yes it was, and yes it was, and yet, the apology wasn’t enough. You had pretty much reviled a couple of hundred million oppressed minority people around the world. “Every form of racism and ethnic hatred,” except for the racism and ethnic hatred of anti-Christ Israel, right? (1 John 2-22-23). You are correct, they most likely won’t. So wake me up when American Atheists does so, okay? The SBC has not been historically linked to Black Supremacy movements. This does not alter my view of the SBC. IMHO it was created to support a sin (slavery) and others. It continues on that path despite all of its pronouncements. I’m more than a little tired of its desire to establish a theocracy in the US and controlling everyone with its gross misinterpretation of the KJV of the Bible. Well, there you are. And there YOU are. This is actually a stunning turnaround. I grew up (Catholic) in a small southern town in the 1950s where the biggest church was the local Baptist Church, followed by the Methodist and then the Presbyterian. Segregation was the law and they all fully supported it. Desegregation and the Civil Rights movement was, well, traumatic for many of them. I am surprised because I thought it would take another generation for the Southern Baptists to get to this point. Good leadership makes a difference. So does social media. This is like pulling teeth. It’s good that the DBC finally came out against the alt-right and racism, but at the same time why not address the alt-right and anti-Semitism, the #1 issue for neo-nazis? Maybe they need to work on their statement some more. Mckissic plays the resolutions and race card every year at the annual SBC meetings. ”Tis a joke”. How is it please that the Alt-Right is white supremacist when its constituents include blacks, Hispanics, Jews, Arabs, and those of Asian decent? I wonder how blacks, Hispanics, Jews, Arabs, and those of Asian decent in the Alt-Right feel about being called white supremacist. Most newly planted SBC churches are non-white, Kevin, and many are in places like Pittsburgh or Boston or Vancouver. Stereotypes are convenient, though. By the way, the weirdo religionists you describe are not, and I don’t ever believe were, serious Christians, and certainly not commonplace. I think the life changing Gospel had more to do with it but I appreciate your point and am not trying to nitpick. The SBC has some great leaders. Thanks for bumping into this guy for an interview, sister Adelle M. Banks. You’re the best balancing act in this business with this convention news coverage and update, just as this guy is in nailing down the gist of the political re-positioning of the Southern Baptist Convention. Going way back, they’re still alright by me, even though I’ve told them many a time to stick with only God’s nation and forsake the New Babylon that is the Americans’ republic. This guy would’ve/could’ve been from my then circle of sweet southern fellowship – Praise Jesus! (for the memories). Are there any? I mean really. Can you cite some evidence? It would certainly make the conversation more interesting. Does anyone know of a way I can block this arrogant/ignorant fool? Bottom line he’s just a troll and I certainly do not want to block RNS. Other forums to which I belong have this feature, why not here? I agree. What is interesting is that it is the same Gospel that was once used to make segregation seem acceptable. We grow and learn with the help of the Holy Spirit. But, being so incredibly stubborn, it just takes centuries, millennia sometimes, for what God is trying to teach us to sink in. Good thing our God is patient. Amen. And I think it is the SBC’s loyalty and faithfulness to Christ and His Gospel that has resulted in His blessings. God bless them. This is going to sound nitpicky, but it’s an important distinction: I don’t think the Gospel itself was ever used to make segregation seem acceptable. There were Gospel leaders who twisted Biblical passages to make them appear to support slavery and eventually segregation. There were lots of Gospel Churches that did the same. But, the Gospel itself (ie, the Good News), has always been unrelated to all of that. The Gospel is simply that God provided a way for man to be forgiven of his sins through the atoning death of His Son Jesus. Even Bob Jones (going from memory here) famous Easter day speech only mentioned one portion of the Bible — Acts 17:??. That was after the events that contain the narrative of the Gospel. Interesting note about that speech: It was done as a reaction to Billy Grahm’s very strong statements and actions against segregation of any kind. Segregation, slavery, etc were always evil. Using Biblical passages to justify them was always wrong. But the Gospel itself is beyond reproach.